Healthy and fresh taco salad is a go to meal in our house every summer. Well, I must admit, we have it in the cooler weather too. My family loves salads and this one is one of our favorites. Back to the salad! My daughter is a vegetarian, so this salad is great for her also. One service contains about 10 grams of protein. Eating a meatless meal once or twice a week is so good for you. A National Cancer Institute study of 500,000 people found that those who ate the most red meat daily were 30 percent more likely to die of any cause during a 10-year period than were those who ate the least amount of red meat. Eating less meat or no meat is also great on the budget. A pound of hamburger in Virginia, where I live, runs about $4.50 and a pound of beans or legumes runs less than $1.00. One pound of dried beans equals 6 cups of cooked beans. So, as you can see, eating meatless is a good choice. 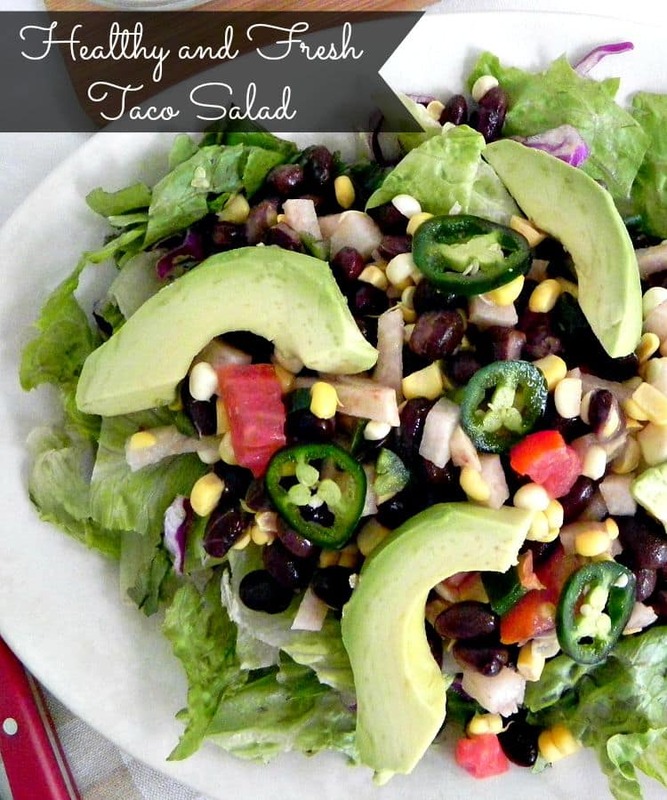 Healthy and fresh taco salad is light and perfect for summer. 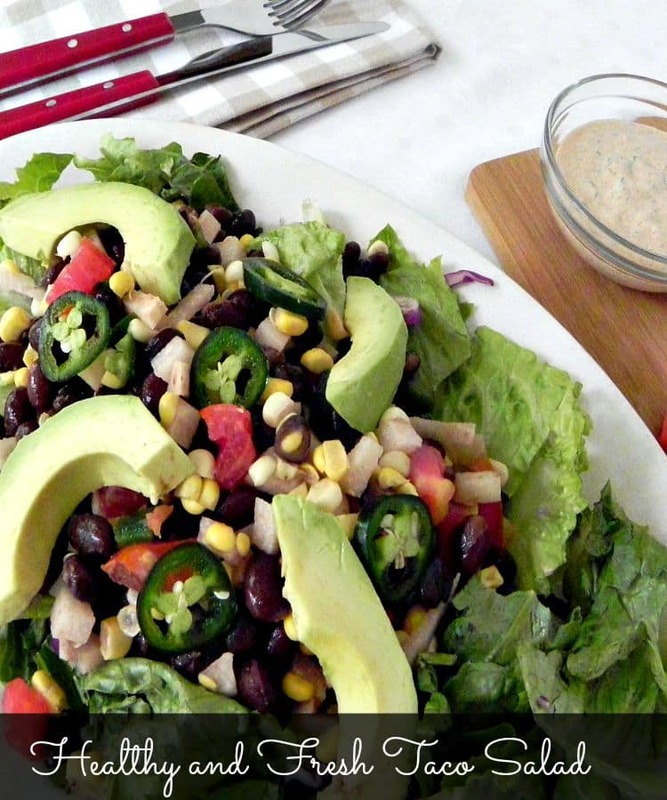 Since this salad doesn’t come in a tortilla bowl, you may want to have a few chips on the side. 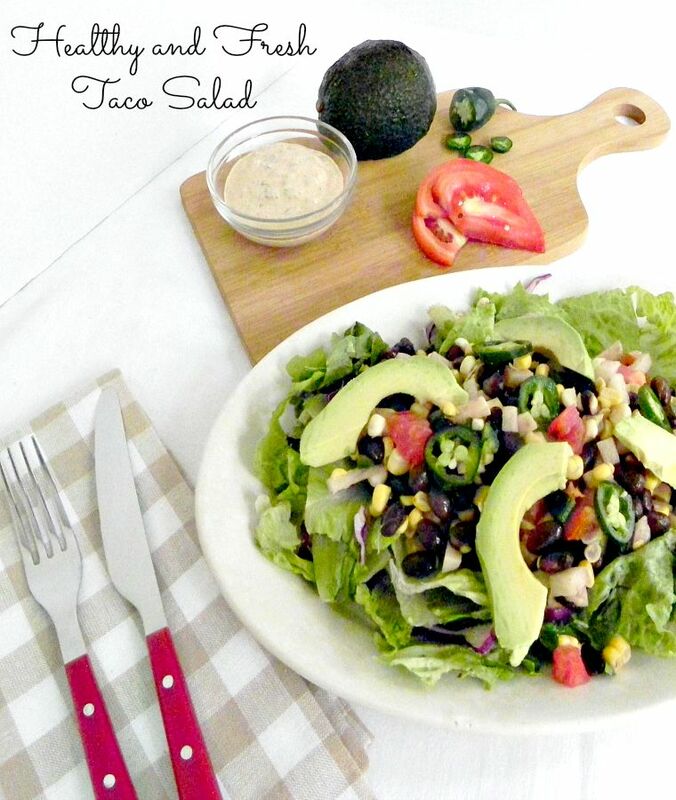 My family loves using whole grain tortilla chips with this salad. I really enjoy it without the chips. There is enough crunch in the salad, that I don’t worry about adding a chip. I don’t usually add a salad dressing to this salad. I find there is enough flavor in it. You can add any dressing of your choice. I have been known to add a spoonful or two of picante sauce. Love the recipe! Those chiles look good! I love some jicama especially with lemon and salt. Thanks for sharing will try this. Yuri, thank you so much for commenting. I love jicama and think it has a great crunch and freshness to it. I hope you enjoy the salad. My husband would love this! Thank you for taking the time to come to Brag About It link party to share this with us! Hope you have a great weekend!